Standard Insurance Agency is an independent agency specializing in a wide variety of services including auto insurance, homeowners insurance, renters insurance, motorcycle insurance, R/V insurance, and boat insurance in Connecticut. Because we are not tied down to any one insurance company, Standard Insurance Agency is able to offer some of the most competitive and comprehensive rates in the industry. Give us a call, let us do the price shopping, and see how we can save you on your boat or R/V insurance. We are able to offer coverage on more than 95% percent of all boats on the water today, including fishing boats, runabouts, personal watercraft and boats up to 50 feet in length and $250,000 in value. Replacement cost for personal belongings – protects items such as mobile phones, cameras, clothing, etc. Superior 24/7 Claims and Customer Service! 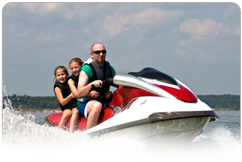 Call or request a quote for Boat or RV Insurance from Standard Insurance Agency today, Bundle & Save! Get the protection you need at a price you can afford. Call or request a quote for Boat or RV Insurance from Standard Insurance Agency today.